"Food Trend Predictions for 2011"
I just came across "Food Trend Predictions for 2011," and once again, some of my favorites from 2010 have made the list. The 10 trends predicted are listed below, and I have written at least 3 items from the list during the last few months. My favorite cuisine has been Japanese for as long as I can remember; however, Korean cuisine has increasingly beat Japanese when I get one of those dining out cravings. In the past year, I have made kim chi, tofu stew, and Jap Chae (Korean glass noodles), all for the first time. Of course, Korean BBQ ribs (Gal-Bi) have been a regular item of my summer bar-be-ques for many years. I had some macarons during my visit with my best friend in Baltimore in September. You just can't help not to like macarons when you see their beautiful colors and perfectly round shapes. They also come in so many different flavors. You just want to try them all. During my visit, my best friend got some macarons from two different local bakeries. 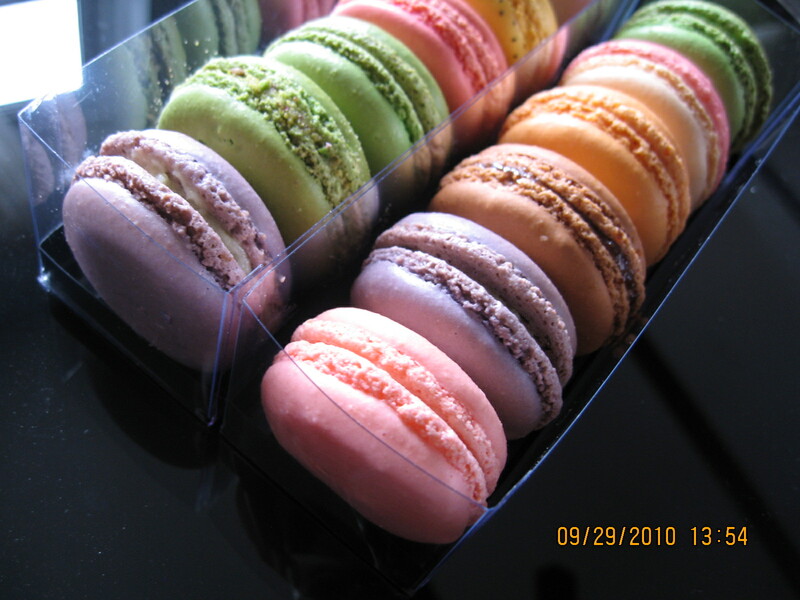 One of her friends stopped by with more macarons she just brought back from Macaron Cafe in Manhattan. I happened to be going to New York City after leaving Baltimore, so I headed straight over to Macaron Cafe to try more flavors. One of these days, I will attempt to make them in my kitchen. I will be sure to write about it when I do. As an urban farmer, who doesn't keep livestock, I don't consume a whole lot of meat since it is much more convenient just to eat what I have in my veggie patches. Meatless days are quite frequent, and I don't think much of it. I don't see why we need to eat so much meat and with every meal when there are so many other delicious and nutritional things to eat. For selfish reasons, I am hoping foraging isn't going to be a trend. I pretty much only forage for wild mushrooms. It requires some learning curve and networking to be able to do this, so I am not too worried about running out of wild mushrooms to forage due to competition. I am delighted to see sweet potatoes made the list; however, I am skeptical how it will become a trend since Americans are just not that crazy about vegetables. I have always loved sweet potatoes - baked sweet potatoes, sweet potato fries, sweet potato pie, and sweet potato soup (a dessert soup from Taiwan). Sweet potatoes are featured in many favorite dishes in Japan, Taiwan, the Philippines, and other island nations, so sweet potatoes have always been a part of my regular diet. I wrote about the benefits of sweet potatoes and included a sweet potato gratin recipe in my Thanksgiving Festival at California Culinary Academy blog entry. Whatever the trends are, I hope more people will steer away from processed food. Processed food tends to be high in fat, sodium, and calories. Besides, we shouldn't be eating food out of a cardboard box on a plastic tray. Something about it just seems so unnatural to me. I am usually stuck inside of the cubicle world during weekdays until it is too dark to go mushroom hunting. Yesterday the big boss told the only three people that came to the cubicles that we could all leave at 1 P.M. I was planning on leaving early to revisit my candy cap spot. Two weeks ago, I saw lots of baby candy caps there. It rained almost everyday last week, so I figured they should be ready now. Besides, it's the day before the most anticipated holiday of the year. Nobody else would be there. It would be perfect to go today. When I got to the trail, I heard voices. Hummmm... I was a little surprised that there were other people here. A group of extended family members, kids, dog and all, were on their way out. Some of them were carrying plastic bags. Yes, they had been picking. One of the kids was leading the dog. The dog was very friendly and immediately came up to me for some petting. They saw me with my mushroom basket, so one of the women told me that candy caps are everywhere, and they couldn't pick them all. YES!!!!!! I was screaming with joy inside as I headed further down the trail. I had to take a few moments to adjust my eyes from cubicles to nature before I could see them. Suddenly all the candy caps were popping out at me. I started bending, picking, trimming, squatting, reaching, picking, tripping over branches, trimming, picking, picking, and picking. I had to try not to step on the candy caps since they were everywhere. I normally just pick as fast as I can and deal with cleaning when I get home. Since nobody else was around, I decided to take my time and trim off the dirty parts before putting them in my basket. The mushrooms are mostly clean on the caps except the end of the stems. Since candy cap stems are just as good as the caps, I don't just pick the caps. I pull them out from the dirt. I was holding my pocket knife with one hand to trim off the parts with soil. I also found a few amethystina. An hour passed, and I had started fill up my basket (see photo below). As I moved further down the trail, I saw even more and bigger candy caps. As I bent over to pick them, I noticed even more bigger candy caps inside of the bushes next to the trail. They were more than I could pick. At this point, I decided to share the wealth and texted Chef Pauly with a "candy caps are everywhere" alert. He texted me back saying that he was on his way. Those branches didn't look like poison oak to me, so I decided to make my way into the dense bushes and go for those big candy caps instead. When Chef arrived, I was still inside of the bushes. I called him out to tell him that candy caps were all around him. For some reason, he was having a hard time seeing them. I made my way out of the dense bush so I could point them out to him. Now, he was seeing them everywhere. He started picking continuously and even joked about hiring some day laborers to pick the mushrooms. It started to get dark, and we had to stop due to lack of visibility. Note to myself, leave a flashlight and my new headlamp in my car with the rest of mushroom hunting gear. After I got home, I rinsed the candy caps and put them in my 8-tier dehydrator. For the first time, all the trays were filled with candy caps. Now I have enough candy caps to experiment with recipes other than cookies. Mostly candy caps. one black elfin saddle @ 2 o'clock and a pine spike @ 4 o'clock. Bombus terrestris, the buff-tailed bumble-bee. Photo taken from Biology Letters. I came across an article, Study by 8-year-olds published in prestigious science journal, this afternoon. It caught my attention for several reasons. The title alone is impressive, but it was also a study on how bumblebees see colors and patterns. How did the 8-year-olds manage to study the bumblebees? I have a hard enough time just to get a decent photo of them. They seem to more skittish than honey bees, and I can never get close enough to get an extreme close-up of them. 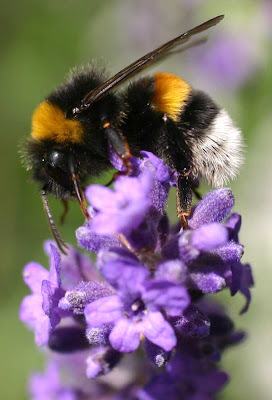 Biology Letters, a peer-reviewed journal of Britain's Royal Society, on Wednesday published a report (PDF, complete with colored-pencil diagrams) on how bumblebees see colors and patterns -- conducted and written by a group of 8- to 10-year-olds in Devon, England. The budding scientists, working under the "light supervision" of a neuroscientist from University College, London, trained bees to go to targets of varying colors by rewarding them with sugar. They reported that the bees were capable of learning and remembering cues based on color and pattern -- a finding that the Royal Society called "a genuine advance." The Royal Society is more than 300 years old and includes some of the world's most eminent scientists. The report's language isn't quite what you'd expect to find in a scientific journal. "Scientists do experiments on monkeys, because they are similar to man," the introduction reads. "But bees could actually be close to man too." These kids have trained the bees to learn and remember colors and rewarded them with sugar!!!! How awesome is that!!!!?????? I was just about to flip over in my chair as I read this. I spent some time learning about bees and beekeeping in Master Ken's Beneficial Beasts in the Garden class. I was surprised at how peaceful the honey bees are. They really are not as scary as people think once you know how they behave. The sad part is, most people refuse to spend 5 minutes of their time to learn how honey bees "think." When I try to explain to people that bee swarms are not there to attack people. They usually try to cut me off by telling me how dangerous they are especially when there are children around. Well, I have seen the students on Merritt College campus scooping up the bee swarm with no special protective gear and nobody got stung. These 8-year-old children have successfully trained their bees for their science experiment, and it's now published in The Royal Society. Perhaps, some adults are not giving children enough credit and forcing their own fear onto their children. The children concluded: "We like bees. Science is cool and fun because you get to do stuff that no one has ever done before." Indeed! This was the most awesome news I have seen in a while. Years ago when my Italian grandma passed away at age 101, she left me her sewing machine with some of her partially finished projects. I had no idea how to use it. This White Zigzag Sewing Machine sat silently inside of the sewing table in a corner of the guest bedroom until 3 years ago. I don't remember what prompted me to lift up the top of the sewing table and flip the sewing machine out of there. I was fascinated by it and amazed at its perfect condition. I could tell that it was well cared for by Granny. The idea of learning to sew popped in my head, but I knew no one who could teach me. I started looking through Craigslist.com, but the lessons seemed expensive and too far to drive. One day I flipped through the class catalog for West Contra Costa Adult School and found a basic sewing class. The school is very close to Sand Village Farm, and I liked the idea of supporting adult school. I signed up for the 8-week class and then signed up for another one after the first one ended. The school provides sewing machines for its students. Most students either had access to family sewing machines or were shopping for their own machines. 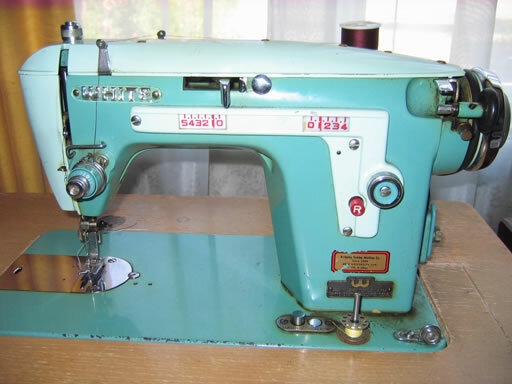 The instructor, Ms. Lang, is very knowledgeable in sewing and sewing machines. She collects sewing machines. I was able to get all the help I needed to learn to use my 1959 White sewing machine. I even found the original instruction book among all the accessories and attachments that Granny left with the machine. I learned to use patterns to make dresses and pants. 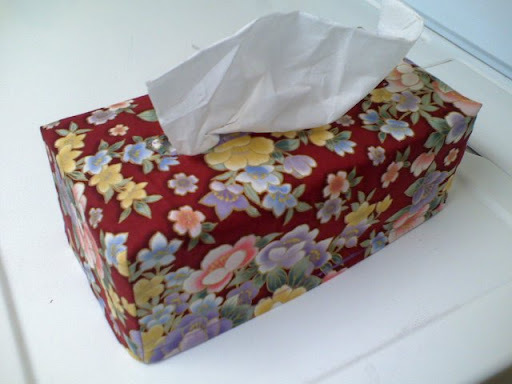 I have made my own patterns with a large thin piece of paper. I tend to use commercial patterns as a reference without following them too closely because I still have a hard time understand the instructions. I have made car seat covers, hats, tissue box covers, Anime costumes, and hemmed and altered countless jeans and pants for friends of cubicle world. I like the sound of the sewing machine stitching away. My biological grandmother passed away before I was born. I have been told that she was a very talented seamstress who graduated from one of the top fashion design institutes in Japan. Maybe sewing has always been in my blood. On raining days when I am not out working on the farm or picking wild mushrooms, I like to either cook or sew. I imagine myself being a frontier woman living the peaceful country life sometimes. I recently made a set of matching hat, mittens, and booties for my best friend's 4 months old daughter. They were actually harder to sew than I thought because of their small size. There were times I had to hand sew some tiny corners because I couldn't manage to get the machine to stitch them without jamming the threads. Of course, I also made several mistakes as I tried to understand the patterns; however, I was quite happy with the end products. My best friend who lives on the east coast received the package today. Oops! They are too big for the baby! I need to make them smaller! I am going back to the sewing table when the cubicle world shuts down next week. I have some designs in my head, and I will make my own patterns this time. I woke up this morning to pouring rain pounding on the roof. It's been raining cats and dogs this weekend and the forecast states that more rain to come for the entire week. On a day like this, a pot of hot spicy soup feels like the perfect meal. I decided to make some Thai chicken curry. I tend to improvise when I cook. For making Thai curry, you need some essential ingredients - Thai curry paste, coconut milk, and fish sauce. Everything else is up to your liking. Most recipes call for chicken breast for chicken curry, but I prefer dark meat, so I used chicken thigh meat. I also added some bamboo shoots, straw mushrooms, and green bell pepper to my curry. Usually you eat Jasmine rice with Thai dishes, but I only have Nishiki rice. I started cooking a couple cups of rice with the rice cooker as I prepped for the curry. Cut up the meat into bite size pieces and bell pepper into strips. Heat up a couple table spoons of oil, add a couple table of Thai curry paste (I use red curry) and saute the meat in the curry. If you like it super hot, add more curry paste or a couple pieces of chili. As the meat is almost cooked through, add half can of the coconut milk and fully cook the meat. Add bamboo shoots, straw mushrooms, and bell pepper strips to the pot and pour in the rest of coconut milk. If you like it soupier, add some water or chicken broth. If you like it thicker, you can use coconut cream instead of coconut milk. As everything is heated through, add a table spoon of fish sauce and a table spoon of palm sugar (or brown sugar if you don't have palm sugar handy). Stir the fish sauce and sugar into the curry and let it simmer for 5 minutes then you are done. The rice should be done cooking as well. Pour a couple ladles of the coconut curry over some steamy hot rice, and you have the perfect meal for a cold raining day. While slaving in the cubicle world, my friend Rosa popped in and told me to take a break and walk around the neighborhood. I jumped up and ran out of the door with her. Seeing the sky is a treat when you work in the cubicle world. We walked across the street and passed by one of our favorite houses in the area. Its front yard has an assortment of interesting drought tolerant plants of various sizes. They are all strategically placed and visually stimulating. There is a sign between the plants with contact information of Vee Horticulture. One of the agave plants is about to flower. It's not common to see an agave in someone's front yard with a stem in the middle that's taller than the house. According to Wikipedia, agave only flowers once. After it's flowered and developed of fruit, the original plant dies. I will go back to the garden to see the flowers and fruit of the agave. Next to the agave house there is a wooden fence. Rosa eagerly told me to look into the holes on the fence. Bee boxes!!!! I could see the bees busy coming in and out through the openings of the boxes. As a breeze blew my direction, I could smell the sweet scent of pure raw honey. Wow, that is a honey heaven behind this fence. I took several deep breaths to inhale that sweet smell of pure honey. We stood there peeking into the fence with envy. Rosa started telling me that she learned about beekeeping in school when she lived in Mexico. I have learned some basics from Master Ken's Beneficial Beasts in the Garden course, but I have yet handled bees. I am excited to know that there are more and more urban beekeepers in the area. There is also a beekeepers association in San Francisco that I would like to become involved to learn more about beekeeping. Two of the questions I get most as a mushroom hunter are "Aren't you scared?" and "How do you know they are not poisonous?" The answers are "No." and "I took my time to learn from experts before picking on my own." I started learning about wild mushrooms after attending a fungus fair more than five years ago. Since then I have attended several more fungus fairs including the one in Santa Cruz. I have attended two of David Aurora's mushroom workshops, taken many of Master Ken's courses including Mushroom Cultivation twice, participated in Point Reyes mycoblitz and Mendocino Mushroom camp. I would learn 2-4 edible wild mushrooms each year and pick as many as I could, so I could become completely familiar with their smell, appearance, and texture. Until I become completely familiarize with a particular mushroom, I would not go pick it on my own. I used to ask the experts a lot of questions, and now I found others asking me mushroom questions. I guess I have learned quite a bit over the years, but I am no expert. I stick to what I know and don't act carelessly. I clean all of my wild mushrooms one by one and toss out anything ambiguous even if I was sure earlier. Sometimes they get squashed or broken in the basket, and I become unsure. There is no reason to eat anything that I am not certain of. Sunday was the last day of Mushroom Cultivation class for this semester. We went on a foray around the campus as a group. The rain season has just started, so candy caps weren't quite ready. I spotted a bunch of tiny candy cap babies that need a couple more weeks and rains to grow. Last year there was an abundance of black elfin saddles but none spotted on Sunday. Instead, we found an abundance of beautiful purple laccaria amethystina, which is a tasty edible. This one was new to me, but I quickly learned their characteristics. The purple color makes them stand out. I also picked a bunch of pine spikes, another new edible for me. Both of them have very distinctive looks. Death Cap (Amanita phalloides), one of the most poisonous mushrooms that kill more people than any other mushroom, is very common in the Bay Area near oak trees, same environment where chantrelle and candy cap grow. We found one huge classic looking Death Cap on Sunday. It just sat there in the middle of the meadow all by itself. As you can see below, it looks very different from all the other wild mushrooms I picked. You can't mistake that from chantrelle or candy cap. In addition to the good edibles, we mushroom hunters, also familiarize ourselves with deadly mushrooms so we know not to pick them by mistake. Death Cap is only poisonous when ingested. You can touch it, rub it against your face, put it in your basket with other good edibles (the spores are harmless), even take a little piece, chew it up and spit it out (DO NOT SWALLOW), and nothing will happen to you; therefore, you should not be afraid of it. I stay away from any kind of Amanita since most of them are poisonous. One of their unique characteristics is that they have an "egg" at the end of the stem when you pull them out of the ground. You can see that in the photo on the wikipedia page. On Tuesday morning, I got an email about a mushroom discussion panel hosted by Kitchen Table Talks at 7 p.m. in the Mission District of San Francisco. Master Ken and 3 other mushroom experts would be giving an overview of the science, history and lore, dispel myths, and offer hands-on practical information. I immediately tried to RSVP to the event but it had already been fully booked, so I emailed Master Ken to let him know that I could record the talk for him. I was determined to get in the event and tell them that I was Master Ken's videographer if I had to. I arrived at the door about 10 minutes before 7, and my name was actually on the guest list. Yes! I quickly went into the venue and occupied the last empty chair in the front row. The event was held in the basement of Viracocha. The lighting in there was very dim - great for clubbing and concert or Kitchen Table Talks but not for clear video recording or show off any details of the mushrooms. In addition to Master Ken, Co-founder of Gourmet Mushrooms, David Law, Co-owner of Far West Fungi, Toby Garrone, and Executive Chef of Millennium Restaurant, Eric Tucker, were on the discussion panel. All of them have extensive knowledge in mushroom cultivation and preparation. The 2-hour talk covered a wide range of topics about mushrooms. One of the highlights was the trivia question for the prize of an assorted mushroom basket. Master Ken picked out a wild mushroom from one of his boxes and asked whether anyone could identify it. The only child in the room, who also sat in the front row, went up to the front to take a closer look and correctly identified it. He is 8 years old! Everyone was surprised and amazed. You can see that portion in Part 6 at 5:10 of the YouTube video. He made me wish that I had a child so I could expose him to the wonder of fungi kingdom. That thought lasted for about 3 seconds then I snapped out of it. For the last 3 days, I worked on the video clips feverishly. I don't work with video clips very often, and I discovered one misspelled word in each of my first 2 finished full length videos after they were all compressed and burned to CDs. I had to redo the process several times and kept proof reading the opening and ending credits to make sure that I didn't skip or misspell any word. I didn't cut any footage off since Master Ken asked me to record everything if possible. Now I officially have a YouTube Channel. You can watch and/or listen to the entire talk at Magnificent Mushrooms playlist. The video quality isn't all that great but the audio is quite clear since I got the front row seating. This weekend was the 41st Annual Fungus Fair at Lawrence Hall of Science, UC Berkeley. This is the largest annual public event of Mycological Society of San Francisco. Initially I signed up to do set up on Friday evening; unfortunately, my bronchitis had worsened after the Hearst Castle Road trip. I ended up arriving the fair at 3 PM today. Although it was 2 hours away from closing, people were still coming in. It's becoming more and more exciting each year at the fair as I got to know more people from the society and urban farming community. Lisa has spent the entire weekend at her kombucha table in the cultivation area of the fair. People of all ages were fascinated by kombucha and her drinks. She has sold out all of her bottled kombucha at the fair! The younger girl in the photo above was so excited about the Mother in jar. She called out her sister to check it out with her. They were so adorable as Lisa explained to them what kombucha mother is. David, the lab instructor for Master Ken's classes, is an artist of painting and felting. I watched him working with his felting needles for the first time. He makes some adorable fuzzy woolly figurines including, of course, little mushrooms. I asked whether I would be able to use Dusty's hair for felting. He thought that was a good idea, and I should collect some Dusty's "wool". Dusty sheds every year, and his fuzzy super soft hair balls roll all over the sun room. I always feel bad that I couldn't put it into some kind of use. Far West Fungi was at the fair as always, and Kyle Garrone was in charge of the their table this year explaining to people about different mushrooms and their mushroom kits available for sale. There is an excellent article in this month's issue of California Country magazine about Far West Fungi, including a video showing how their mushrooms are cultivated indoors. There are different types of mushroom growing kits for different types of mushrooms. West fungi sells kits of mushrooms that grow on trees such as oyster and shiitake. Another vendor was selling mushrooms that grow in compost/dirt, such as button mushrooms and portobello. I have purchased both types many years ago when I first visited fungus fair which initiated my interest in learning more about mushroom cultivation. Every year on the Friday before the fungus fair, many MSSF members go out to collect wild mushrooms in various locations for Fungus Fair display. All the collected mushrooms are labeled and put to display on tables with mushroom experts standing by to answer questions. Fair goers can also bring in their own wild mushrooms to have them identified. In a separate display, the wild mushrooms are arranged to mimic what they would looks like in their natural setting with pine tree or oak logs. Around 4 P.M., the rain started to pour down. It looked like a heavy rain storm, and that's great for my mushroom blocks on Sand Village Farm. All the volunteers and vendors started to pack up lecture materials, displays, and merchandise. The Fair received some media coverage and raised some money for the Society to have more future events. If you didn't make it to the Fair this year, hopefully we will see you there next year. I spent the night at Courtesy Inn of San Simeon. It's just down the road from Hearst Castle, and its rate included a continental breakfast. The room was clean and the staff was friendly. I would stay there again when I visit Hearst Castle in the spring. I had dinner at Big Sur Cafe just steps away from Courtesy Inn. The place is a bit pricey since it is for tourists. The staff was very friendly and polite, and they showed a Hearst Castle video for its customers. In the morning, I got some coffee and grabbed a couple Danishes before checking out from the motel and headed over to Hearst Castle again. As I passed by the Hearst Castle Ranch off Highway 1, there were zebras grazing with the cattle. I left my jacket in the car before getting on the tour bus. That was a mistake. It was drizzling on top of the hill and significantly colder. Tour 1 group was much larger than the Tour 2 I went on yesterday. We had a tour guide and an other person staying behind the group to make sure that no one wandered off, touched anything, or used flash photography. As I toured the castle for the second time, I imagined what it would be like to come here to work on a regular basis. It could be my dream job. This place reminded me of Miyazaki's Castle in the Sky. I prefer to think of it as a magical floating castle for children of all ages instead of an extravagant hangout for Hollywood celebrities. Mr. Lorenzo Lago, the tour guide from yesterday, mentioned how interesting it would be to write tales about the castle. I could already imagine my characters in it. The tour ended at the indoor pool that's covered in 24k gold infused tiles. As soon as we got back on the bus, the rain started to pour down hard. After leaving the castle, I put on my rain jacket and went look for elephant seals along the coast, but there was none to be seen. I decided to take Highway 1 back home instead of 101. I passed many huge pine tress along the coast. I bet there were some porcini growing under those pine needles. I like castles and historical castles. My first trip to Europe, I made sure that I visited Edinburgh Castle. My second trip to Europe, I traveled all over Italy. For some reason I did not visit Hearst Castle until this past weekend even though it is only 4 driving hours from Sand Village Farm. I left home at 8:30 A.M. on Friday morning. I made a stop at Wendy's in Salinas to try their new natural-cut fries with sea salt and got a caramel Brulée latte from Starbucks. Both were quite tasty! I arrived Hearst Castle around 1:30 P.M. I wanted to start my tour with Tour 1 since it was my first time there, and this tour is designed for first time visitors to give them an overview. However, most of Tour 1s were sold out until much later, so I got a ticket for Tour 2 at 3 P.M. and a ticket for Tour 1 on Saturday morning at 9:30 A.M. Tour 1 included the companion movie Hearst Castle Building the Dream shown on the giant 5 story screen in the Hearst Castle Theater, which I was able to watch before my tour began at 3 P.M. The movie answered many questions I had about how the castle was built and the story behind its owners. Five minutes before 3 P.M., we lined up next to the doors inside of the Visitor Center to have pictures taken then got on the tour bus to take us up the hill to Hearst Castle. On the way up the hill, we passed by the cages that used to house bears and other carnivorous animals of Hearst Castle Zoo. For ten years, Hearst Castle had its own private zoo. Some of the herbivorous animals such as zebras, big horned sheep, and antelopes can still be seen on the property. My tour guide was Mr. Lorenzo Lago, who was quite humorous and informative. He told us that his first book, Romance on the High Seas, just got published, which will be available on Amazon.com in a few weeks. There was so much to see in the castle - every door, door knob, tile, ceiling, lamp, painting, statue, etc. I could spend all day there and still be amazed at every little detail. Its architect, Julia Morgan, was one of the first women to graduate from University of California at Berkeley with a degree in civil engineering and the first woman to receive a certificate in architecture from the Ecole Nationale et Speciale des Beaux-Arts. I was fascinated by the huge 24-hour kitchen that had every thing any cook could ever wanted. Hearst Castle raised much of its food supply. It had a poultry farm and a cattle ranch (still operational). It also grew many fruits and vegetables. Its water supply came from natural springs above, piped into two reserve tanks of tremendous capacity. In many ways, it was self sustained although extravagant. I wanted to see more of its garden, but Tour 4, the garden tour, is only available from April through October. I will have to come back next spring. Photos are allowed inside of the castle but no flash since harsh light can damage the artifacts. More photos can be viewed at my Hearst Castle album. Remember those snow pea seeds I collected back in June? It was then I first started blogging. Now more than 100 blog entries later, I have planted some of those seeds before leaving for Mendocino Woodlands Camp and left them on my new propagation table. I covered the potted seeds with a tray (shown in photo below) to prevent birds and squirrels from eating the seeds. One morning I forgot to put the tray back down after checking on them. That night I found holes in the soil of cell packs. Some seeds were stolen. I planted a couple more 6-cell packs just in case. In just a couple weeks, the seeds have turned into seedlings. I cleared out the dried up green bean stalks in the the half wine barrel, collected seeds for next summer, and planted the snow pea seedlings into the barrel. This year I am trying something new with planting the snow peas. In the past, I always planted them next to the arbor. This year I am planting them in the wine barrel with a home made cage in the center for the snow peas to climb on. I think this may make picking the peas easier since I can go around the cage and pick them from all directions. We will see in a few months. I walked into the garage this morning to get some shears to cut down the dried up bean stalks. Suddenly I heard the sound of rapidly flapping wings. It sounded like a huge moth banging against a light bulb. I looked up and was surprised to see a hummingbird frantically banging against the glass on one side of the garage. That side of the garage is composed of multiple panels of glass from the floor all the way to the top. I have no idea how long this hummingbird had been in the garage. Not too long, I hope. The bird could see me and was freighted. I already had the big garage door rolled up, so I knew it was just a matter of minutes before it would find its way out. I have always want to shoot some photos of hummingbirds, and I have spotted plenty of them in hummingbird friendly Sand Village Farm. Unfortunately, they always buzz away as soon as they sensed my presence. This was the perfect opportunity for me to get some pictures of the tiny bird. This hummingbird has some sparkly green feathers on its back. Poor thing was so confused as it could see the trees outside but couldn't get there. Finally, it turned toward the other direction and zoomed out of the garage through the rolled up door. Later on I saw the bird visiting the abutilon flowers right outside of the garage glass panels. After roaming in the woods for 3 days with little sleep and hyperactivity, I came down with bronchitis. For the last 3 days, I drowned myself in organic tomato soup, pork ramen soup, and hot lemon honey tea. I also slept whenever I could with the help of Benadryl. Last night when I woke up from another nap and saw the invitation to attend Thanksgiving Festival at California Culinary Academy, I figured I was ready to go out again. I once considered enrolling in California Culinary Academy for its one year pâtisserie and baking program. I attended one of their open houses a few years ago when they were located off Civic Center BART station. Before heading out this morning, I thought that I'd double check the direction from the BART Station. I was surprised to find that the Academy has moved! It is now located at 350 Rhode Island Street, San Francisco. I decided to drive there since it is not exactly close to a BART station. It turned out that there is plenty of free all day street parking on Saturday and Sunday. The event started out with a tour. The new facility is very modernized compare to the previous location, which was in a historical building in downtown area. After the tour, we got seated in a room for a Thanksgiving dinner cooking demonstration. As we entered the room, I got a cup of hot lemon apple cider which was perfect for my recovery from bronchitis. I wanted the recipe for that more than anything else. Chef Steve Moore demonstrated a main dish and two side dishes - Turkey Roulade with Sausage & Apple Stuffing, Sweet Potato Gratin, and Fresh Cranberry and Orange Relish. I am not particularly into turkey, so I was more interested in the way that sweet potato gratin was made. This particular recipe uses curry powder, sour cream, and shredded extra-sharp white cheddar. I was curious what it would taste like compare to the traditional super sweet gooey Thanksgiving sweet potatoes with marshmallows. At the end of demonstration, we all got a small sample plate. You know that I ate everything. I was starving for some solid food after 3 days of soup. The sweet potato gratin worked for me. The curry powder and ground cumin gave it an Indian flair. The white cheddar gave it a semi-savory taste. It was a good balance of both sweet and savory. This is a dish that I will make because the sweet potato is ranked number one in nutrition of all vegetables by the Center for Science in the Public Interest (CSPI), and the recipe is not as labor intensive as the turkey dish. 1. Preheat oven to 350 degrees F. Cook sweet potatoes in large pot of boiling salted water until just tender, about 20 minutes (do not overcook). Drain well and cool. Peel sweet potatoes; cut into 1/4-inch-thick slices. 2. Mix curry powder, cumin, cinnamon, ginger, and salt in small bowl to blend. Completely line bottom of 9-inch-diameter spring form pan with sweet potato slices, filling in any spaces with cut-up sweet potato slices. Press down slightly. Spread 1/2 cup sour cream over sweet potatoes. Sprinkle 1 tablespoon spice mixture over sour cream. Sprinkle with 1 cup cheese. Repeat twice with remaining sweet potatoes, sour cream, spice mixture, and cheese. Place pan on rimmed baking sheet; bake until cheese is melted and sweet potatoes are heated through. about 40 minutes. DO AHEAD Can be made 8 hours ahead. Cover and chill. If desired, reheat in 400 degrees F. oven until hot. about 15 minutes. 3. Remove pan sides from gratin; cut into wedges. Serve gratin warm or at room temperature.